With only 4 weeks till Christmas I’ve been looking at what I can still get that’s handmade by people like myself running a small business. Where better to start than on Etsy. 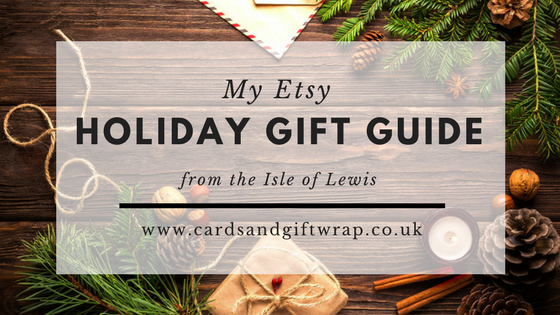 Here is my Isle of Lewis Etsy Holiday Gift Guide! So whether you live on the Isle of Lewis like myself or not, there’s really no need to even leave your sofa to shop local. I do have a disclaimer to make. I am an Etsy affiliate so if you do click through and make a purchase I will get a small commission at no extra cost to you but my gift guide is made up of things I’ve either bought or want to get myself (hint hint if any friends or family are reading). these gift labels made by a lady I met just this weekend at a craft fairs. So I’ve seen them in the ‘flesh’ so to speak. I was really impressed with how professional they looked and I have to recommend the ones with Harris Tweed and Gaelic on them first. She makes other ones too and my daughter really fancied the ‘Naughty or Nice’ ones. You might prefer the ‘Time to Drink Champagne‘ ones. As I’m in to sending snail mail, I really love the vintage postcards. I think it’s the stamps that do it for me. Postal stamps and Christmas together, what’s not to like? If you liked the Nollaig Chridheil gift tags then you might like these tree decorations with the same message. These are made by Sarah of Lewisian Nice who also makes beautiful Harris Tweed clocks. My favourite being this one in ‘winter red‘ as it both looks and sounds so homely. Of course if red isn’t your favourite then there are lots of other colours available, all made from genuine Harris Tweed, hand woven right here in the Outer Hebrides. When you are putting your feet up and watching the time ticking by on your Harris Tweed clock, you’ll need a subtle, festive aroma to help you unwind and absorb the Christmas spirit. I can personally recommend Megan’s candles from Sandwick Bay Candles and this year’s Christmas trio sound very appealing. Megan works out of her home. Every time I visit there are the most captivating, but in no way over powering, scents unfolding from her workroom. If you like to take the fragrances with you then Megan also makes travel tins and car diffusers. Both make perfect stocking fillers. Talking of stockings, you’re going to need a good one to put all these delights in and I have found the perfect one from Sewing Room with a View. Genuine Harris Tweed stockings that won’t ladder or let you down. Sallie also makes beautiful Harris Tweed clothing for when you’re looking for something exclusive and extra special. So now you’re all set. You’ve got the stocking, the tree decorations, the gifts and even the tags. And you didn’t even need to leave your sofa, let alone the Outer Hebrides! I hope you like my Etsy holiday gift guide from the Isle of Lewis. If you know of other Etsy shops from here that I haven’t mentioned do let me know. You can leave a note in the comments below. 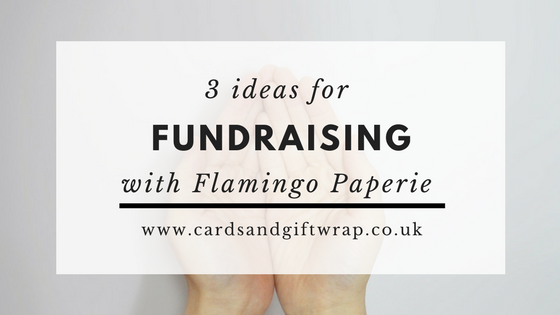 Want to know how you can do some fundraising with Flamingo Paperie? Well here are a few ideas to help you raise money for your good cause. Some of my team joined Flamingo Paperie purely to support their fundraising. My mum is one example! She joined Phoenix Trading initially, to raise money for her local Macmillan Cancer Support Committee. She’s given them about £2-300 each year for the past few years. You could do this too. You buy everything at 70% of retail price so I suggest that you can allow for brochures and courier charges on your orders and safely donate 20% of all your sales to your chosen charity. If you don’t want to join the team but you like the idea of collecting a few orders and raising funds then become a Fundraising Fairy. I will send you as many brochures as you need and samples where possible. You then show those samples and share out the brochures and collect the orders and money. You don’t have to do it alone. Perhaps your whole organising committe could collect 5 orders each? Send me a list of the orders and 80% of the retail price. Keep 20% for your charity and I’ll get the orders delivered direct to you to hand out. ALL our Christmas cards are charity cards, even our advent calendar cards. So buy our cards and you’ll be supporting charities via the Phoenix International Charity. Our cards support both national and local charities. Our Independent Flamingo Partners, like me, nominate the local charities each year. If you have other ideas how I can help you raise money then please ask. I love supporting charities and it’s one of the reasons I became an Independent Flamingo Paperie Partner. Have you heard of Christmas Advent Books? If you have children then I think this is a must leading up to Christmas. The idea is simple. Wrap up 24 Christmas books and unwrap one each night before bed leading up to Christmas Eve. You can wrap your advent books randomly or you can plan which one you have each night. If you want to do it randomly then you don’t even need to add numbers. We put our tree up at the beginning of advent or the beginning of December. Then after I’ve wrapped the advent books I place them under the tree. Here are some of our favourite advent books, in no particular order. A snowy day, a deserted school and the teacher you least want to see. Welcome to Snow Day, the most magical day of the year . . . When Danny goes to school one quiet, snowy morning, the last thing he expects to find is a deserted school and his least favourite teacher. But that’s exactly what he does find. And what starts as the worst day imaginable, ends as the most life-affirming and magical day of the year. An incredibly moving story about finding friendship in the most unexpected of places. While Santa and Mrs. Claus eat their dinner, Santa sneakily feeds his sprouts to one of the reindeer rather than eat them himself. The result is, uh, smelly, to say the least. Now, Rudy can’t seem to stop releasing windy pops from his backside as he and the other reindeer help Santa deliver presents on Christmas Eve. The rest of the reindeer are downwind from Rudy and they are not handling the sprouty wiffs so well. They laugh so heartily at Rudy’s rear-end trumpet that they simply cannot fly the sleigh as usual. It’s up to Rudy’s super-turbo gas to get them back home. Originally written by French author Reuben Saillens and later retold by Leo Tolstoy, this endearing story has now acquired the status of a folk-tale. The heart-warming story of Papa Panov’s generosity reflects the true spirit of Christmas. It is Christmas Day, and Papa Panov, the lonely old shoemaker, is expecting a special visitor. Things do not turn out at all as he thought, but by the end of the day the sparkle is back behind his little spectacles. A beautiful gift edition of a much-loved classic. The Empty Stocking – a brilliantly funny Christmas story by Richard Curtis and Rebecca Cobb. Every December an envelope bearing a stamp from the North Pole would arrive for J.R.R.Tolkien’s children. Inside would be a letter in strange spidery handwriting and a beautiful coloured drawing or some sketches. The letters were from Father Christmas. They told wonderful tales of life at the North Pole: how all the reindeer got loose and scattered presents all over the place; how the accident-prone Polar Bear climbed the North Pole and fell through the roof of Father Christmas’s house into the dining-room; and how he broke the Moon into four pieces and made the Man in it fall into the back garden; how there were wars with the troublesome horde of goblins who lived in the caves beneath the house! Sometimes the Polar Bear would scrawl a note, and sometimes Ilbereth the Elf would write in his elegant flowing script, adding yet more life and humour to the stories. No reader, young or old, can fail to be charmed by the inventiveness and ‘authenticity’ of Tolkien’s Letters from Father Christmas. This sumptuous picture book is based on the beloved classic and retold for younger children to provide an ideal introduction to the story. This gorgeous book with its vibrant illustrations is sure to enthrall very young children as well as those just beginning to read. It is a delightful present for any child lucky enough to go to the ballet at Christmas, and wonderful compensation for those who aren’t. Ebenezer Scrooge is a mean-spirited old man who hates everything – even Christmas! But when three spirits visit him one Christmas Eve, Scrooge is taken on a journey into the past, present and future that will change him forever. Specially rewritten as part of the Usborne Young Reading Programme for readers growing in confidence. This is an enchanting retelling of a traditional German tale, written for children just learning to read. It’s Christmas Eve and all is ready for Christmas – until seven spiders cover the tree in cobwebs. Will Christmas Day be ruined – or can Father Christmas save the Day? It’s Christmas Eve, and the entire house is sleeping-all except one little boy, woken by the jingle of bells and the clatter of reindeer hooves on the roof. As he tiptoes downstairs, who will he find? When Katie and Jack are woken up late on Christmas Eve by a loud sneeze, little do they realise that they are about to embark on the most amazing evening! Soon they are flying high across London, over snow-dusted landmarks, through the star-scattered sky with the one and only Father Christmas, in his sleigh, with his magical reindeer! But can they help Father Christmas to deliver all his presents and be back in time for Christmas morning? When a sack of presents lands – THWACK – right by Norman’s stocking he is overcome with excitement. He really must have been a very good slug this year. But after a frenzy of unwrapping he spots a label – and realises that none of the presents were meant for him, but had in fact fallen off Father Christmas’s sleigh. Norman knows he has to get the presents to the family they’re meant for – but how can he manage it on time? Can one little slug save Christmas? Jack loves everything about Christmas. Except for one thing: he does not like Brussels sprouts. When Jack’s parents bring home the largest sprout he has ever seen, things are about to get out of control. Sproutzilla is the meanest, greenest Christmas ruining vegetable ever and now he’s heading straight towards Santa! It’s up to Jack to save Christmas, and there’s only one way to do it . . . He’ll have to eat the sprouts! A picture book with over 30 flaps to lift, in which the Boot family prepare for Christmas, and Poppy and Sam wonder whether Santa will bring them what they asked for. An interactive reading experience for young children, who will love to lift the robust flaps to find out what Christmas surprises are hiding underneath. This illustrated volume provides a sensitive telling of the nativity story which aims to evoke a sense of wonder and mystery in very young children. The detail of this flap book incorporates details such as mice hiding in the corner of baby Jesus’ manger. This book provides a fun, seasonal adventure across Christmas Land with puzzles for young children to answer on every double page. Brightly coloured, detailed illustrations in cartoon style along with plenty of maps and guides help children experience the absorbing adventure. It is perfect for keeping young minds active over the holiday season. Answers and hints are on the last two pages of the book. An enchanting picture book retelling of the original Christmas story for very young children. Beautifully illustrated by Elena Temporin, this is a wonderful gift for young children. This is a sparkling collection of festive poems for children that form the perfect companion for Christmas. The magic of Christmas fills the pages, with a delightful mixture of well-loved classic verse and lively contemporary poetry. All lavishly illustrated by Anna Luraschi. This title includes poems by William Wordsworth, Christina Rossetti, Alfred Tennyson, Thomas Hardy, Charles Causley, Gerald Manley Hopkins, Benjamin Zephaniah and John Hegley. It is a lovely read-aloud book to share with younger children too. Celebrate the holiday season with this book featuring real lights that glow with every turn of the page. Set in a winter wonderland, follow one child on his journey home through a snowy landscape. Diecuts reveal lights throughout, becoming lit-up shop windows, carol singers’ candles, stars in the sky and finally a star on the tree. Told in verse, this gift book will bring the magic of Christmas into everyone’s home. Everyone’s favourite aliens are full of the festive spirit and so they are giving away their beloved underpants – shock, horror! Join them as they help out in Santa’s busyworkshop, put neon pants on Rudolph and tie knickers up in the place of stockings. But remember to hold on to your pants – this special pants giveaway is for one day only. Ho-ho-ho! Merry Christmas! At each different house that he visits Father Christmas drinks and eats all the goodies left out for him. Before long he really, really, really needs a wee. So much so that he even forgets to leave the presents behind. But he dashes back, delivers all the pressies and flies home at high speed to avoid an embarassing accident . . . There’s just one tiny problem . . . He’s lost his house key! The house is full of strange bustling noises and peculiar smells. Everyone is busy hanging holly and blowing up balloons, and where is that tree going? Disconcerted by all the unusual activities, Mog escapes to the roof, and there she stays…until, unexpectedly, she returns with a bump! When the Browns take Paddington to the Christmas grotto at the local department store, their journey through the Winter Wonderland is full of unexpected surprises. But the best surprise is a present from Santa. After all, who else would find the perfect present for a bear like Paddington? Join Paddington on his festive adventure as he discovers why Santa Claus makes everyone’s Christmas so special. What are your favourite advent books? If your advent books aren’t on the list above then I’d love to add them. Please comment on the post and I can add them in. A cheeky tip is to check out The Book People, who often have bundles of 10 or so Christmas books for £10ish. If you’re looking for some last minute stocking fillers then here are a few ideas. Or perhaps you need a couple of activities for that quieter period between Christmas and New Year before the children go back to school. These should keep everyone busy. You can never have too many notebooks! What more can I say? Happy Families is the classic game. I remember winning this as a child but somehow I never do anymore! Despite being used as my lick-machines over the years it appears my children still enjoy making paperchains, either in the traditional way or to make decorations for the tree. Doodle your way to New Year with these sweet illustrations ready for you to add your own artistic flair to. Keep the whole family scribbling, doodling and colouring at mealtimes and in between. 1m by 1m is a lot of space to colour in! These are just a few stocking fillers ideas, you’ll find more in my shop. I’ve been busy making Christmas cakes. As some of them are for others, like teacher thank you presents, they need to go in nice Christmas Cake Boxes. 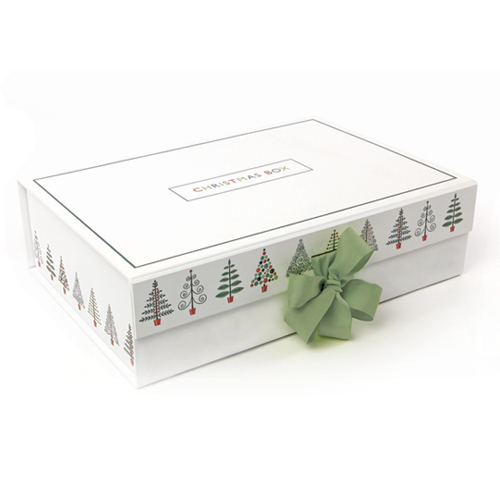 Here are my favourite Christmas cake boxes that I use for small gifts. I find all of these just perfect for small gifts, not just at Christmas but obviously at Christmas they get used more. If you need something to put a small cake in then these are great. Approximately 10cm cubed they will hold a small cake or a large decorated muffin. I made these Christmas cakes in a large muffin tin (it has 6 holes in the tin not 12 so you can imagine the kind of size). My mum tells me she used to make Christmas cakes with her school pupils in baked bean tins, so I think these boxes would work for those too. By the way – do you like my snowman decoration on the cake? These smaller boxes will hold a standard cupcake or muffin. They will also hold sweets, chocolates, homemade biscuits etc. oooh – or a surprise! The base of these is about 6cm square and there are 5 in a pack. I’ve also used these mini boxes for ‘party bags’ at my children’s birthday parties. I discovered pretty early on that when children get party bags all they were really interested in was the sweets! So not wanting to give out a huge bag of sweets I tried these on our guests. They went down a treat as they looked so different it was more like giving out a present to unwrap and I think the children liked that more. 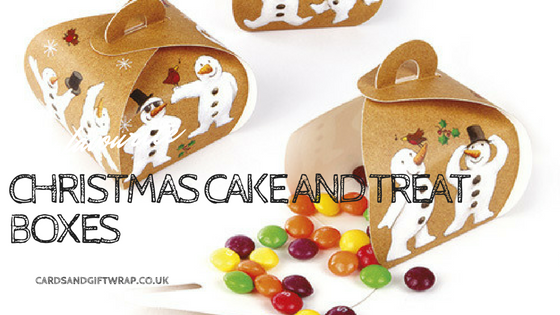 So if you’re in need of Christmas Cake Boxes for those small homemade gifts then look no further. PS I’d love to know what you put in yours. Do comment and share with us, or post a picture on my Facebook page. I am always being asked for Nativity crafts for Sunday Schools, preschools and in the home so I’ve put together a list of some ideas. Younger children can have fun cutting out and colouring in their own Nativity Scene. et has lots of other ideas too. Then you can act out and talk about the Nativity story. Alternatively use oven drying clay to make a lasting Nativity set. I found a great clip on Youtube to give you a start. Do a Nativity related jigsaw. This one is good value with 4 x 500 jigsaws in it. Four jigsaws titled, Window Shopping, Letter to Santa, The Nativity Play and The Queen’s Speech provide an opportunity to talk about lots of aspects of Christmas. Jigsaws are great for developing little minds and doing them together is a great social opportunity too. Plus it will give you some downtime in the run up to Christmas. Make your own framed nativity scene. Cut out old Christmas cards, or draw your own background and characters and turn it in to a framed Nativity scene. 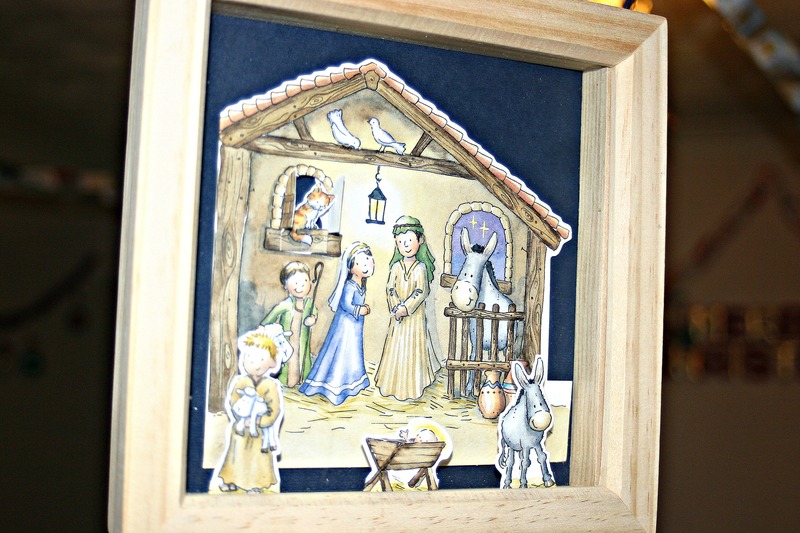 Use a deep box frame to build a 3d picture of the Christmas story and then give as a gift. I have to say that contrary to the popular phrase, ‘No one sends Christmas cards anymore’ I think most of my friends and family do. So, I wanted to add a little post about why I send Christmas cards. When all we get through the letterbox these days is junk mail and bills, we all love it at Christmas time when there’s a heap of cards from the postman. It certainly cheers me up when a few cards fall on the door mat. My children equally love to be able to open lots of mail. I’m not the best at keeping in touch with friends and family. While Facebook and the like are good for these things, it is so much nicer to receive a hand written note. There are so many great cards out there. 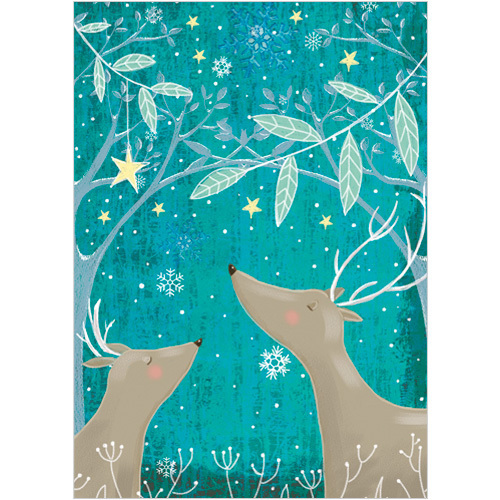 Of course taking the time to hand make a card is extra special but if time doesn’t allow that there are so many lovely Christmas cards available. My favourite are our advent calendar cards as these are just that little bit different. Glitter, sparkles and pop out bits. Beautiful flowers, snow scenes and nativity stables. All these help to make the home festive and welcoming at Christmas. Finally, I think, Christmas cards show someone they are important. The fact you’ve taken time out of your busy life to think of them and write a card speaks volumes in someone’s life. Take time to send a few cards and help someone know they are special to you. What was the most memorable Christmas card you received? Let us know in the comments. 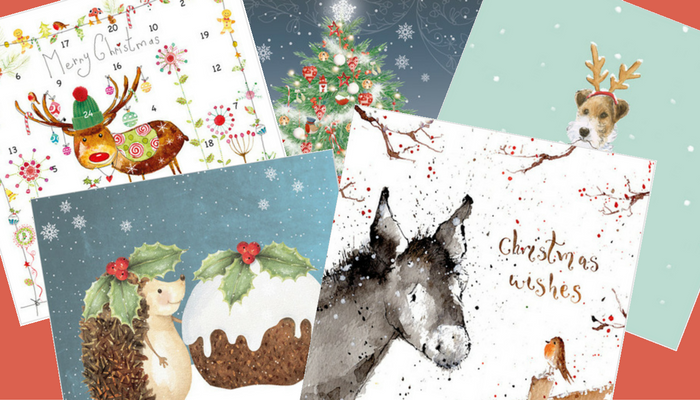 ALL our Christmas Cards are charity cards! Personalised greeting cards might save you time but there’s nothing quite like a handwritten card. Our personalised greeting cards service has finished but you could use our Christmas cards to impact your customers with a stunning festive illustration that stands out from the crowd. If you would like to see some samples first just ask and I’ll be happy to send you some. Perhaps you have a business that could use every day cards too? E.g. how about sending ‘New Home’ cards to your customers if you’re an estate agent, or ‘Sympathy’ cards when people lose their pets if you’re a vet. Sending a greeting card to your customers with a handwritten note makes an overwhelming positive statement. Boost your image by making it personal and send our exclusively illustrated cards to your clients today. Thought I would ask my three older children (10, 7 and 5) what goodies they would like in a Christmas Eve Box and here’s what they suggested. First find a box, add a few sweets and maybe some hot chocolate and you will keep the whole family entertained. Start the Christmas festivities off the night before. This one is ideal and not too pricey either. Save yourself time and get the Christmas Eve Box Refill containing craft, colouring, decorations and games. Just add your own sweets and hot chocolate. Even if it’s a beautiful sunny day outside, you can still have snow inside with this safe, non toxic instant snow – just add water. For a couple of quid you can’t go wrong with this in a Christmas Eve box. With 6 sheets in this Christmas Holiday Fun pack there are oodles of doodles to keep the whole family scribbling if necessary. 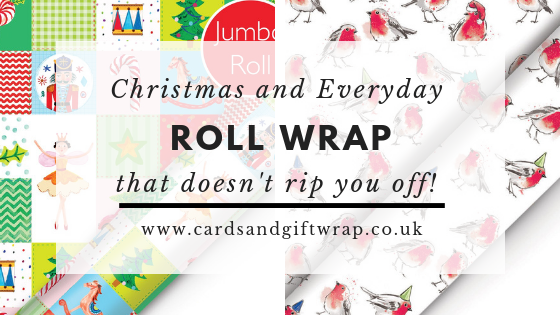 This huge paper tablecloth will keep everyone busy at Christmas. Either use it just as something to do or for maximum value put it on the table for Christmas dinner with a few pens, crayons or coloured pencils and watch all ages get stuck in. Also makes a great poster. Alternatively try the colour in Christmas Tree from Flamingo Paperie, or their colour in nativity bunting. It’s Christmas after all, there probably need to be some sweets and what better way to add to a Christmas Eve box than in a cracker. Cadbury have lots of Christmas confectionary ideas as you would imagine but this one is a great box or stocking filler. If you don’t do chocolate, e.g. if you’re dairy free then Hampergifts have some fabulous retro sweet hampers and packs. If your children love craft activities then why not get them a subscription to the Mister Maker Club? They send you a craft box every month or 2 weeks (you choose, there are 12 boxes in total so you won’t be subscribing for years and years, another bonus in my opinion!). Order your subscription in time for the first box to be part of your Christmas Eve activities. If you need some ideas of books for Christmas Eve then we traditionally read Twas the Night Before Christmas before they go to bed on Christmas Eve but they also love Illustrated Stories for Christmas. A Christmas Carol is also a great read for older children. Christmas Day will be so busy that bedtime stories probably won’t happen. I believe no Christmas Eve Box is complete without a story. Settle them down for bed and take the chance to stop for a minute and remember what Christmas is all about amidst the preparations. 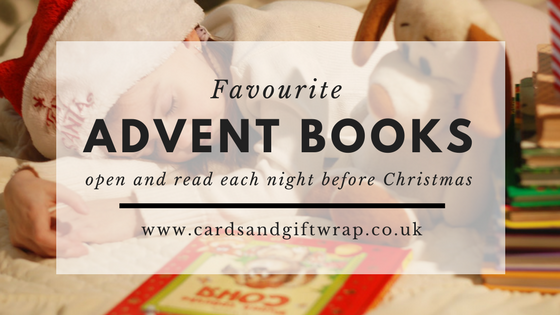 If you are true bookworms then plan ahead with some Christmas advent books. All my family, from ages 1 to 80+ love jigsaws. So I always get a couple of Christmas jigsaws in for the holiday. It’s just perfect for those ‘I’m bored’ moments when the weather is too bad to send them outside. When I get a chance to sit down for 5 minutes it’s great relaxation for me too. Of course there is always the option of a DVD. Why not schedule in an hour or two to put your feet up, get out the popcorn and watch a DVD together. Our Christmas favourites are Muppet Christmas Carol, It’s a Wonderful Life, Miracle on 34th Street and Elf. What’s your favourite? Share with us in the comments below, it might give someone else who’s stuck an idea for their Christmas Eve box. Remember these? We called them fortune tellers I think. This pack from Flamingo Paperie has 6 sheets, with jokes, forfeits, fortunes and more. Great fun for Christmas Eve and could be used for Christmas Dinner entertainments too. For just a couple of quid it provides lasting fun for all. I haven’t tried myself but I did think if you are making your own Christmas crackers that you could include one of these in each cracker if you do some of the initial folding. You can see a video I did of a Christmas Eve Box full of activities here.